Very Understanding Hubby has been on a day off today, so after Sweet Cheeks and I got back from playgroup, I skulked off into The Bat Cave for a little I'm ignoring Everyone time. It was luuuuurverly. After Cataloging and sorting my Copics into colour co-ordinating pots the other day, (OCD, can't help it and yes, as it was afternoon at the time, I had my tea in the strawberry mug, so all was well with FayeWorld.) I realised I had been ignoring them for a little while. In fact, I hadn't used them since we moved to Derby. Bad, bad Fluffie. So, I dedicated my afternoon to making my Copics feel loved and cherished and I promised them I will not ignore them for so long again. I love Copics. Sorry Old Faithful (waterbrush). Anyway, I needed to make two birthday cards for the same person and although the laydee they are for is girly, she's not really pink and girly. What to do? In the spirit of making things difficult for myself, I decided to use a colour I normally ignore and went all blue. Job done. I'll show you the other tomorrow. woo hoo faye...this is gorgeous, I love how you have coloured that little lady...and what can I say...those flowers are just FABEROONEY!! forgot...thanks for joining us at Sweet Stampin this week...good luck!! Me likey a loy sweetie...! gorgeous image..fabby colours and such a great sketch too hunni...! Totally gorgeous and adorable love it. And so you should be pleased, it is truly gorgeous. an absolutely gorgeous card Faye, I like the image and your colouring is perfect. Lovely to see you joining us at Sweet Stampin' this week. This is just too cute - beautiful colouring with your new found desire to use your Copics again. This is fantastic Faye! I neglect blue a lot too, but am always pleased when I use it! It is very pretty! Those flowers are fabulous! Great paper too! Glad your copics are happy and feeling loved. There are so many of my craft goodies that need attention! *lol* You just crack me up girl!!! I love that card! the colors are really nice! Love the flowers too! Picasa by google has a straigthen button but somehow mine look wonky! Love the card, soooo cute :) My top tip for photographing is photograph it standing up or lying down with a few embellies spread around it BUT photograph it at a slant then it looks purposely wonky! 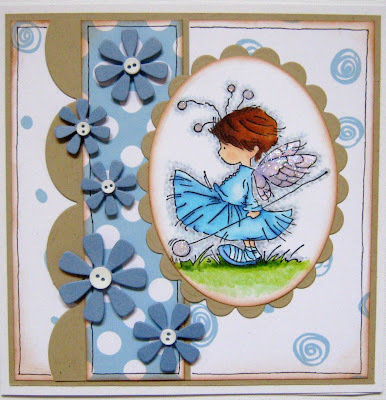 gorgeous blue card Fluffy....great colouring of that lovely image....have a wonderful weekend! Faye - how gorgeous. You never cease to amaze us with your gorgeous cards. Wonky photo's, Hmmmm - maybe don't drink before taking!!!!! lol. Well hellooooo sweetie pie this is one 'eck of a gorgeous card I do love your LOTV's your colouring is fabulous & def shouldn't neglect your copics when your colouring looks like this....its fantastic hun. Totally gorgeous hon, can't wait to see the other one, & yes I know I'm behind lol! Love the colours & your colouring is fabby & is that doodling I spy too??? I edit my photos in PSP & that helps but I'm still not the worlds best with photos. FAB flowers! Where are they from???!!! And fantastic colouring too, the copics must feel well and truely loved again as this is a masterpiece my dear!! !